The outer appearance of your house is the first thing that people see. It can reflect your indoor space and people an idea to how the inside of your home looks. A little creativity will do the trick. Your outdoor space can be just as relaxing as your living room. The first step is to add a few pieces of furniture. Adirondack chairs are one of the most recognizable forms of outdoor furniture. They are armchairs made of wooden slats that have an angled back, a deep seat and large flat arms. Originally called Westport chairs after a small town in upstate New York, these chairs have been around for over 100 years. Wooden Adirondack chairs are popular because they are so comfortable. The slanted back and deep seat provide hours of comfort. They're the ideal place for reading a good book, listening to music or just enjoying the view. The original chairs were made of wood and painted dark green or brown. Cedar is a favorite wood as it resists rot and is lightweight but very strong. 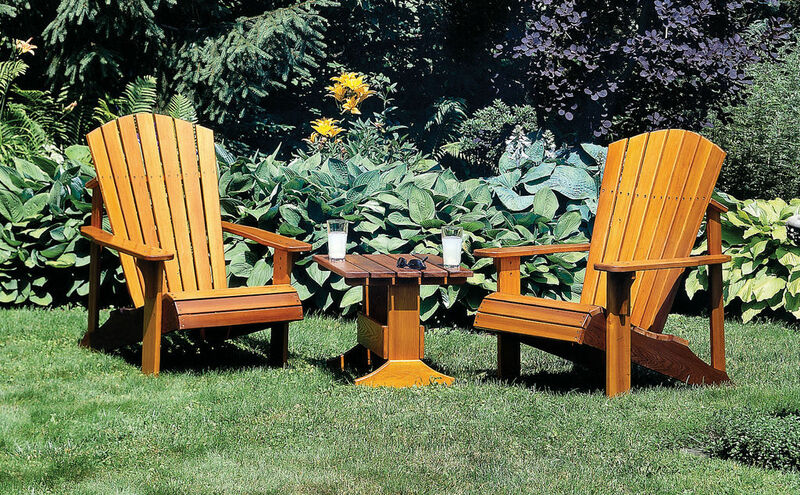 Adirondack furniture can be made out of mahogany, cypress, alder, teak southern yellow pine and eucalyptus. Wood used for the construction of these chairs undergoes a lot of preparation and treatment to make it perfect and flawless. Teak Adirondack chairs are quite elegant pieces of furniture to add to your outdoor furniture collection. These chairs can employ a wide range of finishes. The natural look is very popular as the wood slowly ages giving it a very distinctive look. You can also use wood sealants to prevent weather damage and maintain the chairs original looks for years to come. The color of the chair is dependent on the type of wood used in its construction, but you can also get them painted in a variety of colors. Various decorations can be used to enhance the beauty of these chairs if a person sees it necessary. All types of wooden Adirondack chairs should be well maintained and frequently cleaned for them to stay in good shape. Plastic chairs are an alternative if you cannot manage to keep wooden chairs clean. They require virtually no maintenance other than the occasional cleaning. The only issue with plastic chairs is their limited color selection, but greens and browns are still the most widely used. Cedar Adirondack chairs are the perfect addition to a backyard deck or patio. With a wide selection of styles and colors, you should be able to find the perfect chair for your backyard. Once you get an Adirondack chair, you'll wonder how you ever lived without them. Choosing to incorporate these wonderful pieces of furniture into your outdoor furniture collection can be a great step in improving the general look and aesthetic appearance of your home. So waste no time if you wish to get some your outdoor space a much-needed makeover.